Both the International Criminal Tribunal for the former Yugoslavia (ICTY) and the International Criminal Tribunal for Rwanda (ICTR) are now about to close. Bachmann and Fatic look back at the achievements and shortcomings of both tribunals from an interdisciplinary perspective informed by sociology, political science, history, and philosophy of law and based upon on two key notions: the concepts of legitimacy and efficiency. The first asks to what extent the input (creation) of, the ICTY and the ICTR can be regarded as legitimate in light of the legal and public debate in the early 1990s. The second confronts the output (the procedures and decisions) of the ICTY and the ICTR with the tasks both tribunals were assigned by the UN Security Council, the General Assembly, and by key organs (the president and the chief prosecutors). The authors investigate to what extent the ICTY and the ICTR have delivered the expected results, whether they have been able to contribute to 'the maintenance of peace', 'stabilization' of the conflict regions, or even managed to provide 'reconciliation' to Rwanda. Furthermore, the book is concerned with how many criminals, over whom the ICTY and the ICTR wield jurisdiction, have actually been prosecuted and at what cost. 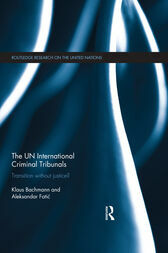 Offering the first balanced and in depth analysis of the International Criminal Tribunals, the volume provides an important insight into what lessons have been learned, and how a deeper understanding of the successes and failures can benefit the international legal community in the future. Klaus Bachmann is Chair of International Politics at the University of Social Sciences and Humanities in Warsaw, Poland.